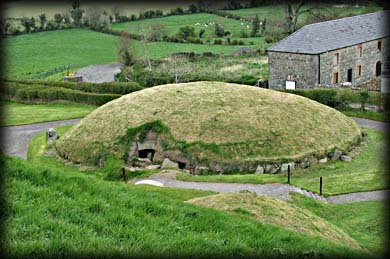 Although Knowth is not the most famous of the passage tombs in the Boyne valley personally I think it is the real gem of the Bru na Boinne complex. 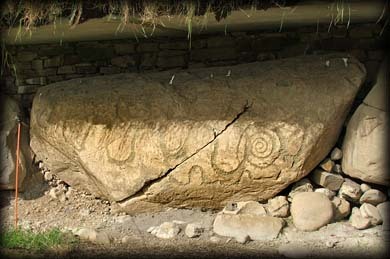 Excavations began here in 1962 and it was not until 1967 and 1968 that the two passage-tombs were discovered. 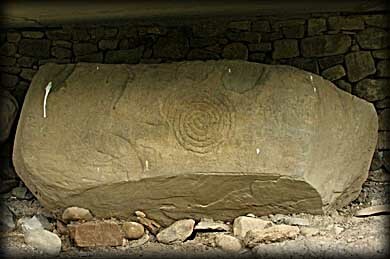 These passages are opposite each other, the western passage is a 34 metre long undifferentiated passage tomb and the Eastern has a 40 metre long passage leading to a 7 metre high cruciform chamber. 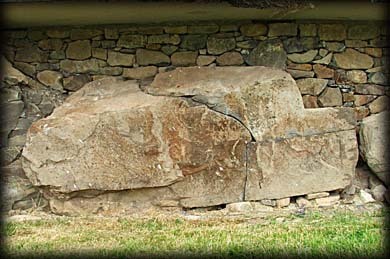 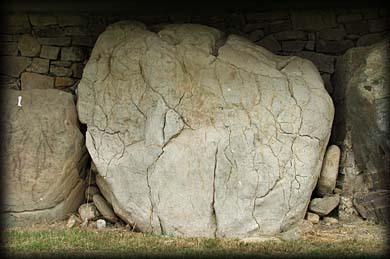 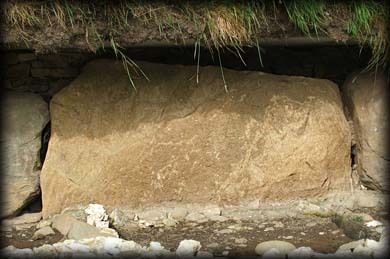 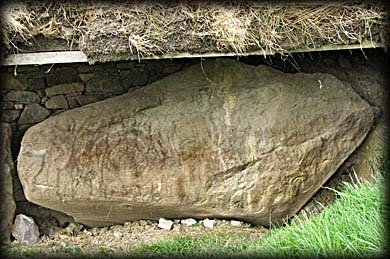 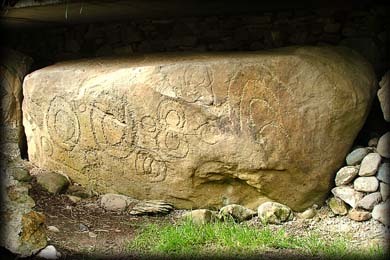 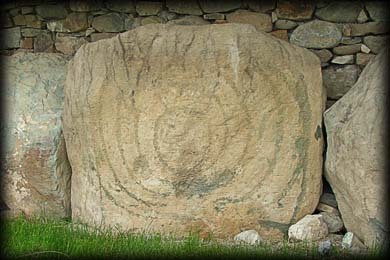 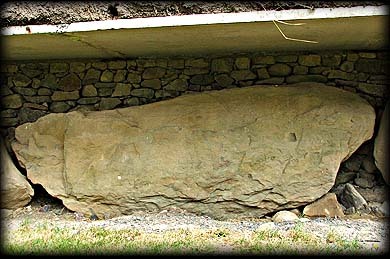 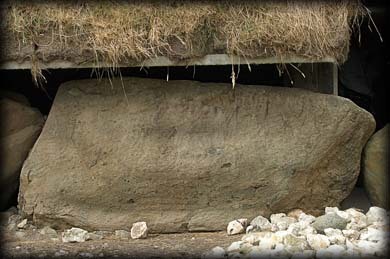 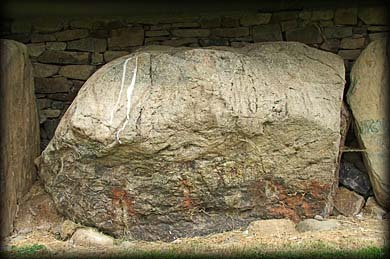 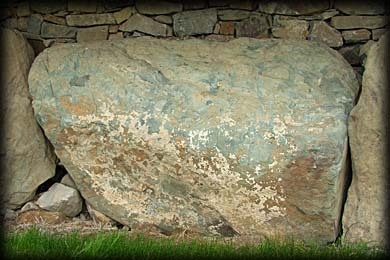 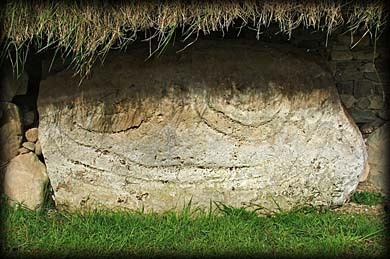 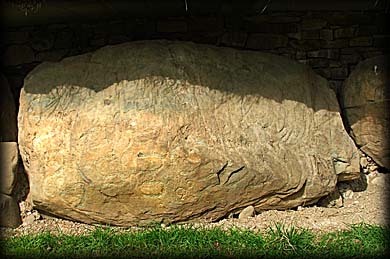 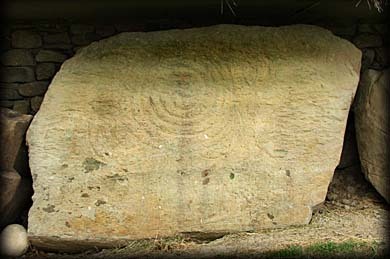 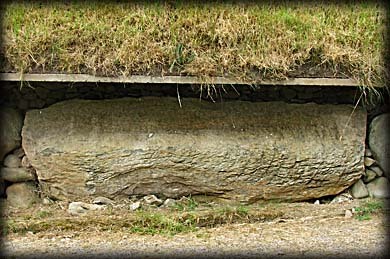 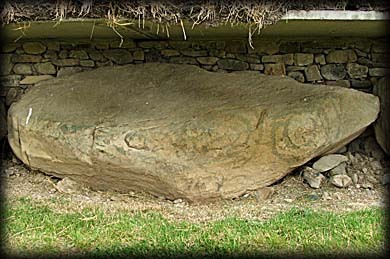 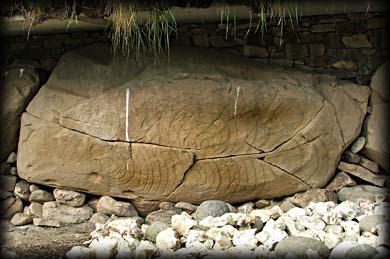 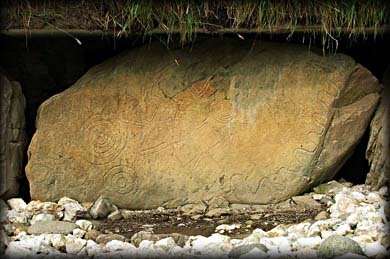 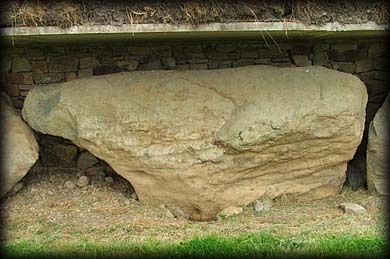 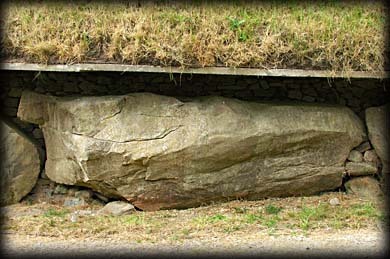 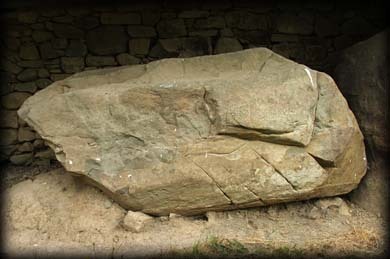 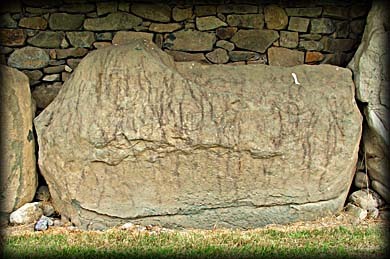 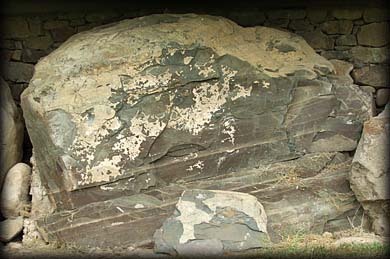 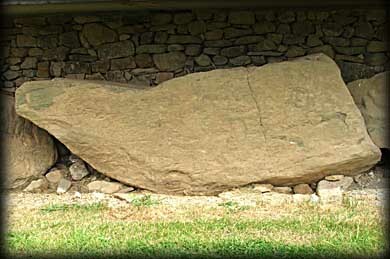 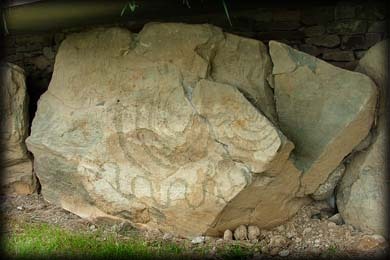 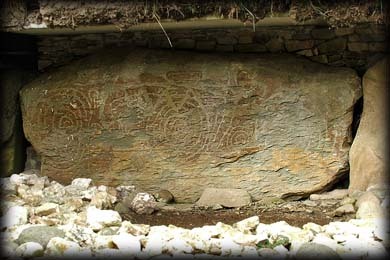 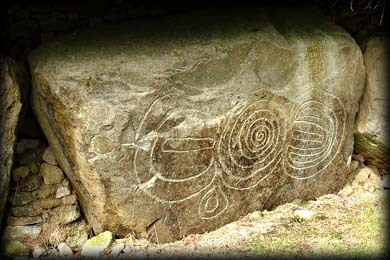 The thing that makes Knowth really special is the amount of passage stones and kerbstones that feature rock art, a total of 261 stones at Knowth are decorated, approximately 45% of the total of engraved megalithic stones in Ireland. 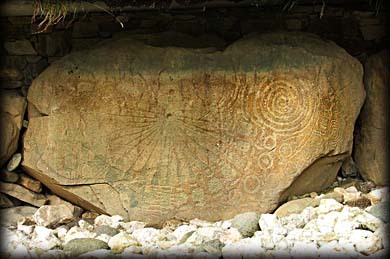 The only way you will gain admission to Knowth is through the Bru na Boinne visitor centre on the Donore road, where there is a permanent exhibition of artefacts on display all of these on show are replicas, the originals are now in the National Museum of Ireland. 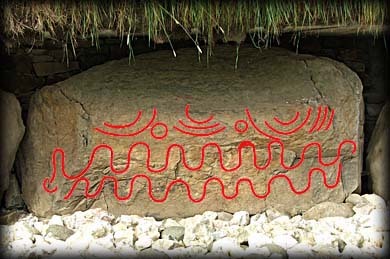 As can be seen in the picture above Knowth has a number of satellite mounds encircling the main mound, seventeen in total most of which are passage tombs. 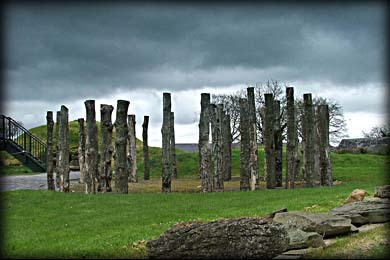 There is also a reconstruction of a wooden henge that stood outside the eastern passage, pictured right. 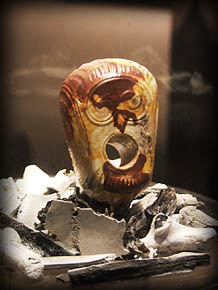 Amongst the artefacts found in the Eastern passage tomb were a giant basin, also known as the Dagdas cauldron, found in the right hand recess of the chamber and now in the National Museum and a beautifully engraved macehead carved from flint, pictured left. 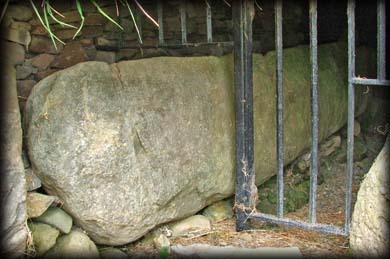 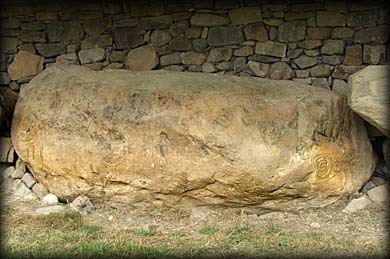 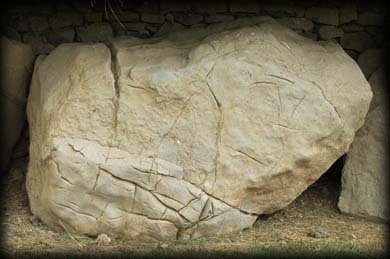 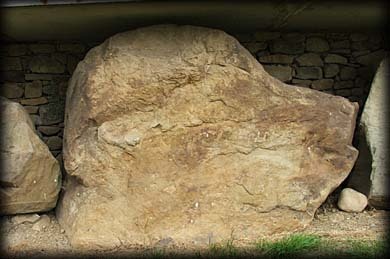 A small stone phallus was also found in the Western passage. 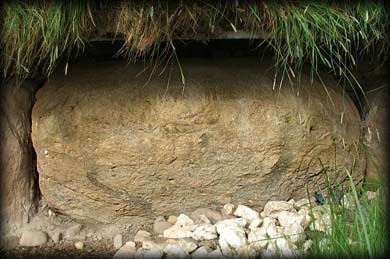 It is now believed that the passages at Knowth have a lunar alignment rather than being aligned to the spring and Autumn equinoxes as first thought. 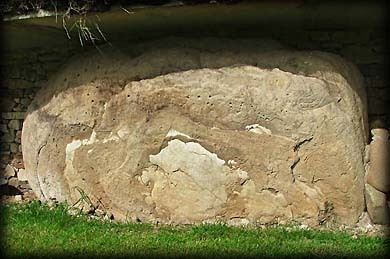 Pictured left is one of the smaller passage mounds viewed from the top of the main mound. 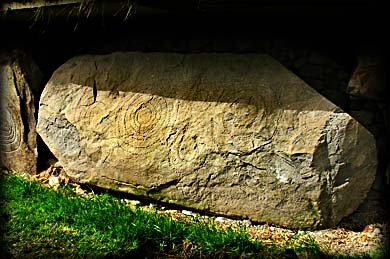 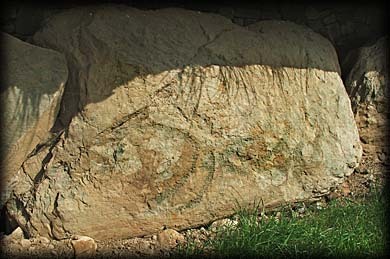 There are a total of 127 kerbstones surrounding the great mound at Knowth, most of which are decorated in some way, and supporting the suspected lunar alignment of the passages these kerbstones are thought to bear lunar symbols or lunar calculations. 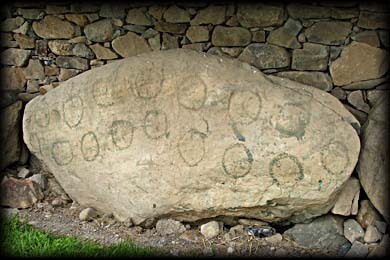 There are two numbering systems for the Kerbstones The first Number is George Eogans and the numbers in brackets are from Martin Brennans numbering system. 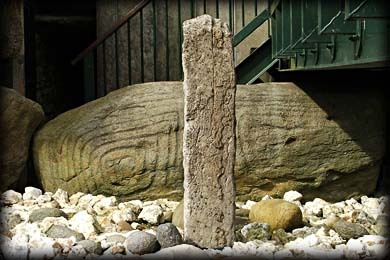 Pictured right is the entrance to the Eastern passage with the decorated entrance stone known as kerbstone 11. 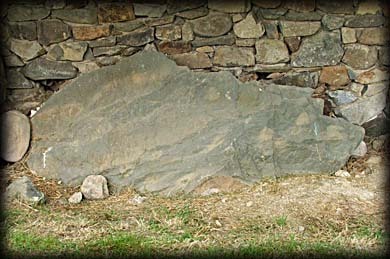 You can also see the bridge which allows access to the passage and the newly constructed visitors chamber. 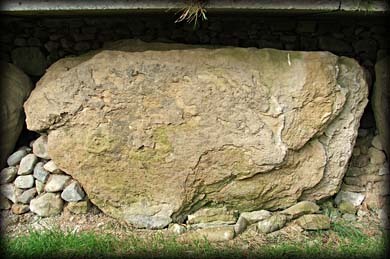 Kerbstone 20 is one of three kerbstones that are missing. 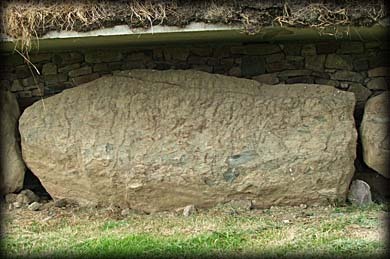 From here Martin Brennans numbering system makes a slight adjustment as some of the stones were still buried when he estimated that there were 134 kerbstones. 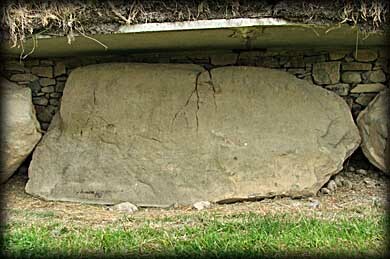 Pic kerbstone 19, John Donnellan. 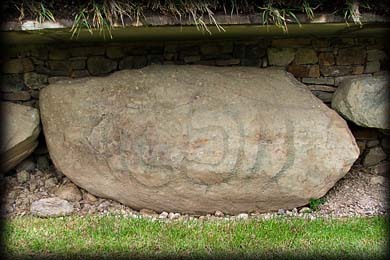 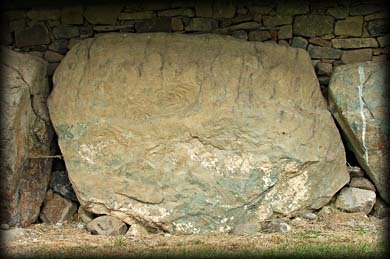 Kerbstone 37 is also one of the three missing kerbstones. 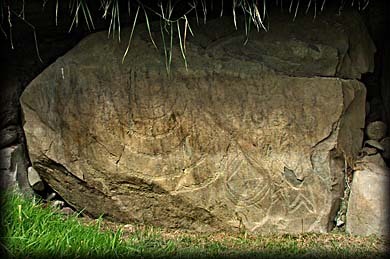 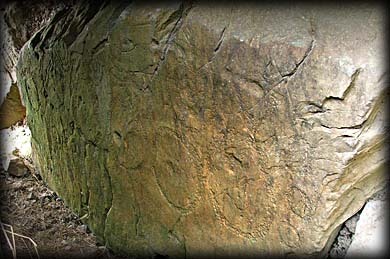 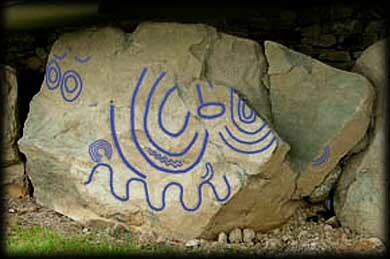 In time I will add drawings to the High resolution images in order to illustrate the rock art inscribed on some of the kerbstones.